Win the Limited Edition Blue PlayStation 3 and Bioshock Infinite! Be in with a chance of winning the limited edition console along with the must-have game Bioshock Infinite! 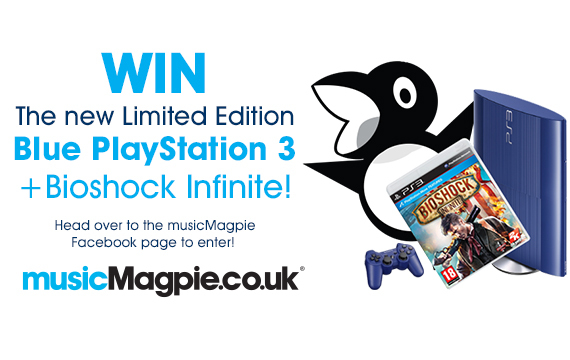 Here at musicMagpie we love games and they don’t come much bigger than the recent Bioshock Infinite so in order to celebrate the release of the Limited Edition PlayStation 3 Console & the new Bioshock Infinite game we’re giving you the chance to win a Blue Limited Edition PS3 console + a copy of the game – #magpiewin! All you have to do is head over to our Facebook Page and enter your details … It’s that EASY! There are two runners up prizes up for grabs too! Each runner up will also receive a copy of the game! Bioshock Infinite looks as if it’s already destined to become one of the most imaginative games of the year; set in a floating city in the sky named ‘Columbia’. You take control of Brooker DeWitt as he navigates his way around this mysterious city which upon first glance is a rather pleasant place to live but when you start to peer beneath the city’s facade, it becomes clear that there’s more to Columbia than meets the eye. You can read our in-depth look at the game here where we delve a little deeper into Columbia and its inhabitants. So if you want to be in with a chance of winning this amazing game along with a Limited Edition Blue PS3 console then simply click here and enter your details – EASY! In the mean-time make sure you check back right here on the musicMagpie entertainment blog for all the latest in all things movie, music and games! ← ‘Where would you boldly go next’ COMPETITION!